After years of counseling the sisters to stop their fighting and discord, he left the monastery one day in despair because they would not make peace. He decided to leave them to themselves, he would no longer be their spiritual father. On his way back to the Monastery of Saint George, he met the saint himself, who appeared to him as a radiantly handsome young man and demanded to know why he had abandoned the nuns. 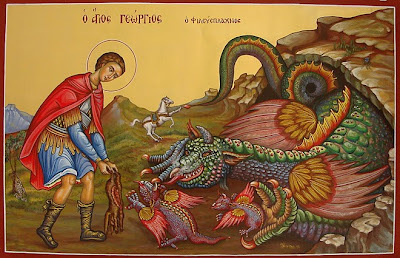 Not realizing that it was Saint George, Father Arsenios replied that he could not endure their misbehavior, whereupon the saint responded: "And why did you not reflect that our Lord endures the misbehavior of millions of men, even those who do not believe in Him, but insult Him, blaspheme Him, and despise him. He endured even those who crucified him, and while on the Cross He prayed for them saying, 'Father forgive them, for they know not what they do'. Why is it that you cannot endure the wrong acts of forty monastics, who are women, weak natures, and who did truly grieve you through their sins, but have now repented?" Saint George then showed him both the light of heaven, and the stench and darkness of hell. and told him that if he did not return as the nuns' spiritual father, he would never see heaven. The young man's face flashed like lightning and he disappeared. At that very moment, Fr. 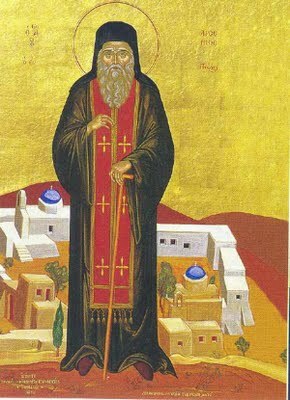 Arsenios understood with whom he had been talking. Turning back to the monastery, he found the whole sisterhood on their knees in church, praying and crying to god that Elder Arsenios might return and forgive them.